All winter long, you’ve been dreaming of laying on a sandy beach, listening to the soothing sound of waves. And the best part of that dream? Not knowing or caring what day of the week it is. That’s beach life, and we love it! So let’s get that Cape Charles beach bag ready for some lighthearted action, shall we? We’ve got 7 tips for making you the perfect Chesapeake Bay beach bum. 1. Beach Bag–Instead of taking a water cooler with you, get a beach bag with a beach bag with a plastic lining. Even an old water resistant handbag with a plastic lining will do. Or, go to Breezes Day Spa. They have beautiful, sturdy beach bags. Put your icy cold drinks in the bottom of it. Then roll your beach towels and place them on top of the drinks. Now you have cold drinks AND a cool beach towel to lay on! 2. Add some escapism to your bag. Got a fave book you’ve put off reading? Now’s the time to add it to your beach bag. Sink a little further down in your beach chair and enjoy. Be sure to wear a hat! 3. Leave-in Conditioner. We love the sun, we do. But it’s hard on your hair. Add some leave-in conditioner to your bag and spritz it on to help protect those locks. 4. Waterproof Makeup Bag. This is a great place to store your phone and digital camera. 5. Sunscreen. Pile it on before you get to the beach and let it dry. Then remember to re-apply, re-apply, re-apply. A spray sunscreen is excellent for easy application. 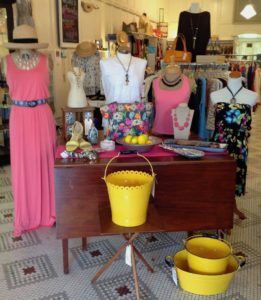 And, if you happen to forget your sundress, stop by Periwinkles, A Unique Consignment Boutique. They just won Best of Virginia for the Eastern Region! dancing like a Mexican jumping bean on the hot sand. And for extra credit, we encourage you to tuck into your bag an after-sun moisturizer. Not only will it cool you off, it helps to replenish the moisture the sun takes away. What about you? 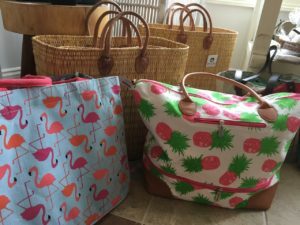 What are some of your favorite beach bag items? Share it with us on Facebook. 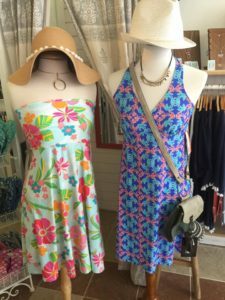 This entry was posted in Bay Haven Inn Experience, General, Summer, Uncategorized and tagged beach bag, Breezes Day Spa, Cape Charles, Periwinkle Consignment Stores by admin. Bookmark the permalink.